Would you describe your kiddo as a bit of a trickster? Does he like to have his fun with illusions and other magical trickeries? Is he super into Norse mythology? Well, you may not be Odin, King of Asgard, but that doesn’t mean your little one can’t be Loki! Grab him this amazing costume and your youngster can become the God of Lies and Mischief! Of course, that is just a nickname for this infamous comic book villain. He may have been mostly evil throughout the majority of Marvel’s stories, but one thing that wasn’t bad was his sense of fashion. 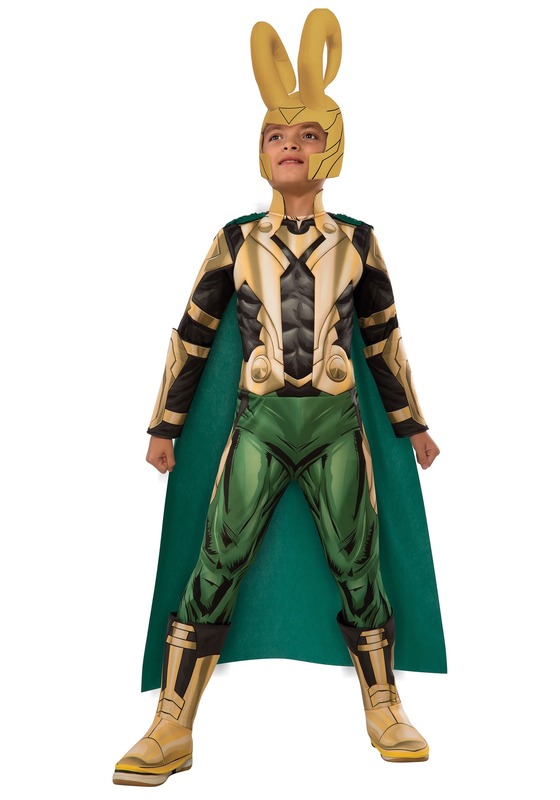 With this tasteful costume, your kiddo can bring Loki’s unique style to life. It will seem as if this fictional character has jumped right off the pages of a comic book or the screen in a movie theater. This jumpsuit even has soft-sculpted fiberfill padding so that it looks as if your little one has the body of a Nordic god! And yes Loki’s awesome double horned headpiece is included. So your kiddo will look as mighty and frightening as one of the most powerful foes Thor and the rest of the Avengers have ever had to face. If you have two rugrats running around your home you can grab our Kids Thor Costume and they can enjoy the ultimate sibling rivalry this Halloween. On the other hand, you yourself can also grab a Thor Costume for yourself and you and your little one can reenact your favorite scenes from the comics and movie!